As anticipated last month, Google's experiment that lets you reorder and annotate search results is now live. Google SearchWiki should be available automatically if you are logged in to a Google account and it can be recognized by the visual clutter added to the search results. Next to each result, you should see three new options: a way to promote a web page at the top of the results, an option to remove results from the page (they're still visible at the bottom of the page) and a feature that lets you share public comments about a result. After promoting a result, Google shows some unnecessary information about the other people who promoted the result. It's important to remember that all the changes are saved to your Google account and they won't affect the search results for everyone, at least not directly. If you want to see an aggregation of all promotions, demotions and comments, go to the bottom of the page and click on "See all notes for this SearchWiki". This is the real wiki built by Google and it's easy to access by adding &swm=2 to the URL of a search results page: http://www.google.com/search?hl=en&q=google&swm=2. Comments are not very useful, although you could find insights for some obscure queries. The absolute number of people who promoted a search result is not very useful either, especially when you'll see big numbers like 314,159,265. SearchWiki's main idea is to give users the opportunity to manually customize the search results and make them more predictable. Since many people repeat common searches like [mail], [weather], [news] and Google's results are constantly changing, it's nice to pick your favorite results and display them at the top. If you can't find a site you like, click on "Add a result" and manually add a page in the list of top results. - for unfamiliar queries, check the wiki to find a different ranking and potentially useful comments. Try to avoid the wiki for queries that are likely to be spammed. - visual clutter. The only way to remove the additional icons displayed next to each search result is to log out. - it's difficult to reorder results, since the only action allowed is to place a web page at the top, after all the other promoted pages. If you promote the page again, it will become the first result. Google has always used people's clicks to improve the quality of search results, so the new options could influence the ranking algorithms in different ways. "At this time we aren't using SearchWiki to influence ranking but it is easy to see how that could happen in the future," said Marissa Mayer. "Search is adapting to the Internet as it becomes a more participatory medium. Now you have people telling us specific things about how they'd like to see their search results. You could imagine if we do see a particular site (about which) people have a unanimous opinion, that might trigger external things. Like maybe we should check out our spam control," suggested Cedric Dupont, product manager for SearchWiki and Google Knol. How do I enable SearchWiki? Log in to a Google account and make sure that you use the English(US) interface. Not all the accounts have the new feature enabled, so you should wait until it's available or try a different account. hey alxe you CAN see all your wiki notes, there is a link at bottom, what do you mean by:"an obvious feature would be to get a permalink for your edited results, but Google doesn't offer this yet" ??? First of all, http://www.google.com/reviews/w is not exactly a permalink since it shows the annotations for the current Google account. now what it lacks is the introduction of a privacy layer in the comment system so that you can decide if you want all google users to be able to see your comment or only your google friends. Let's say that they thought the comment system from a blog/digg point of view and this is a good starting point, now they need to introduce a little fb style and this will probably boost also the rest of their still-in-infancy social-network structure, such as the friend system on google reader. Google searchwiki is an innovative approach. I like the animated clouds: http://www.google.com/images/swxa.gif. Actually, there is a way to see the standard results without logging out, but it's only temporary until the feature is localized: add &hl=all to the URL of a search results page. How do you get to the wiki Search On google ? i messed with some SERPs. How do I get back to default? Is there potential to effect SEO'ers, if it is used into the algorithm? If so, then it could be misused and abused. Use the down arrows for promoted results and click on "Restore" for removed results. You can also use this URL: http://www.google.com/reviews/w. how do i disable this MESS, Google? 1. Besides login into Google, is there anything else necessary to activate this. 2. If not then what is the time frame for rolling this out to the rest of the world. For now, SearchWiki is only available for the English-US Google. To try it, click on "Go to Google.com" or "Google.com in English" on Google's homepage (alternatively, go to google.com/ncr to reset your cookie or use this page: http://www.google.com/webhp?gl=us&hl=en). I tried clearing my cache and cookies. I also visited the two pages above and I still dont see SearchWiki? Me neither. Google Wiki doesn't exist for me. Really don't like SearchWiki. I wish I could disable it without having to log out. It just doesn't work for me as well. I still can't see the interface. Looks like Google knew this "feature" could be unpopular, then they want us to get used to it by throwing it on our faces all the time. They'll release a way of disabling SearchWiki when nobody cares anymore. The search information provided by their users may be a valuable information and probably will be used to improve main search algorithm, maybe that's why it could not be disabled. it appeared then disappeared, hope it's not coming back. I think its gone for good. This tool is just so simple to manipulate. Yeah, it was enabled, and then it was gone. I imagine those of us who first saw it was a test audience, and the test didn't go as expected so they pulled it back in to patch up. Seem like google now taking over the job done by stumble upon. 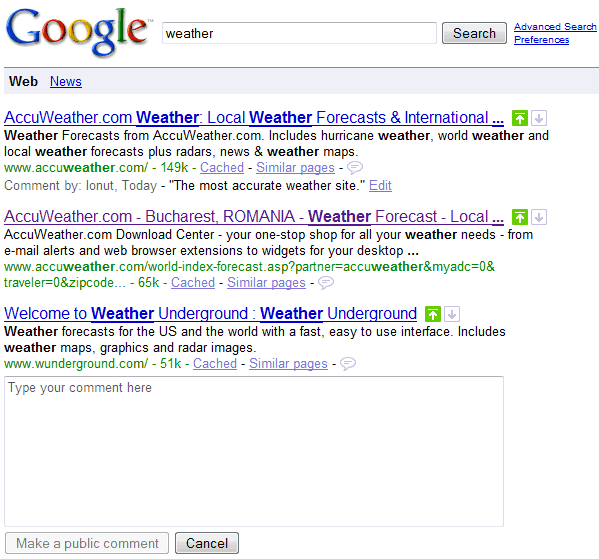 It's a new revolution in the internet search engines....I like the feature. But is it not a bad news for SEO service providers? Personally I want SearchWiki gone and alas, that doesn't seem to be possible. I really think an opt-in/opt-out option is necessary for a change of this magnitude. can it integrate google bookmark? How about learning (i.e. machine learning) of the users preference using those labels. See toppersearch.com. It doesn't automatically sort but instead allows the user to label and then sort to taste. How do you disable this? The only way I have found to do this is to log out of my Google account. Constantly logging out is a pain. Really annoying feature that I cant disable. I use a search engine to find new results, if there are any results I want to revisit I use bookmarks. Googles results are stale enough without this. We've done some analysis of the SearchWiki roll out here at iCrossing, including what the new public commenting features could potentially mean for brands. Check out Jonny Stewart's (Head of Natural Search, UK) analysis on our blog, Connect. ACK! I want "NEW" - I don't want "MINE". Redundant and annoying. I think I'm with ^^Mick^^ on this one. Why can I not disable this feature? I don't like it. I think we need a way to turn this off. Search engines don't need to make it easier for organized groups with an axe to grind to manipulate the search results. That makes them less useful. Even until now, I have NEVER seen this interface on my Google search. Is it because I have CustomizeGoogle? It's pretty cool especially when you can ignore it.. I was in favor of it initially thinking that it would some how learn based on your search behavior and then display personalized search results for you personally. For example, if you remove results repeatedly from one domain, then results from that domain for subsequent searches will not be shown (or shown as de-ranked) to you personally. Anyway, this appears not to be the case and the Filter included with CustomizeGoogle (a Firefox add on) no longer works properly as a result. Seriously, there is a lot of webspam out there and I would really like some way to get rid of those results from known webspam domains automatically when ever I perform a query. I really need the way to export and import my searchwiki notes. I have two accounds, one for work and the other for private. 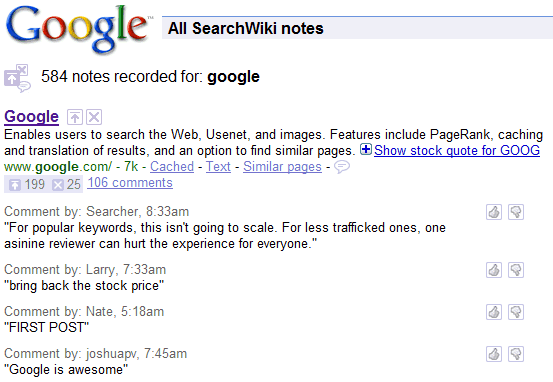 I want to move searchwiki notes from one to the other. Where is the WikiSearch function? I'd like to try it, but can't find it.